I have lots of little zip-lock bags with the start of projects in them. I have them mostly in one laundry style basket I keep on a closet shelf. In one bag I found this tatted lace. I have been told stories of my maternal grandmother and that she tatted. So of course I wanted to try it. This is a fairly simple trim pattern. I didn’t remember that I had done about 45 inches of it. I need to find something to sew it to. There were also 2 motifs like the ones in the the Big Rose Doily. I have made that pattern before in ecru, so those may have been my trial pieces. I think I cut off the ball from the tatting to make the motifs. It is weird feeling finding stuff that I made a long time ago. It almost seems like the stuff one finds in an antique or thrift store. Someones unfinished project left to be found by someone else. Only this find is lace that I have made. This gloom hanging over the country right now is giving me gloomy thoughts. I am sure I can put this lace to good use and not leave it for someone else to find. This entry was posted on Thursday, February 5th, 2009 at 3:00 am and is filed under Crochet and Lace. 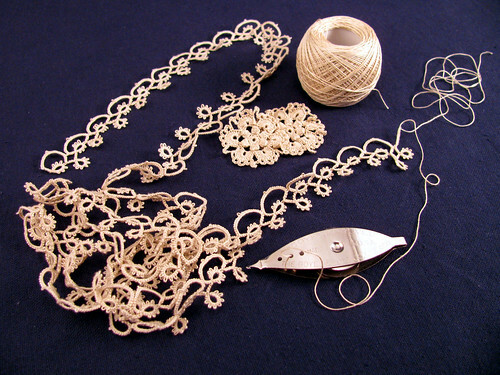 Tagged: Crochet, Lace, Tatting, Thread. You can feed this entry. You can leave a response, or trackback from your own site. What a nice find! I started tatting 12 years ago and now find UFO’s of knitting and crochet when I go looking. LOL! I still knit and crochet but not nearly as much. It surprises me sometimes when I see what I used to do…in a good way usually.